It takes a basic understanding of physics, lots of team work, and a desire to have fun. 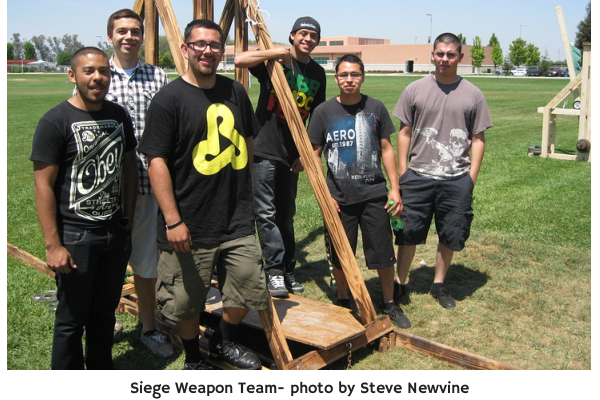 Students in two of Merced College’s Physics classes were doing their best at working together in the annual Siege Weapon Competition held on a warm spring afternoon at the College practice soccer fields. It may look like something from the Haggar the Horrible comic strip, but it’s actually a way to put lessons from the classroom into action. 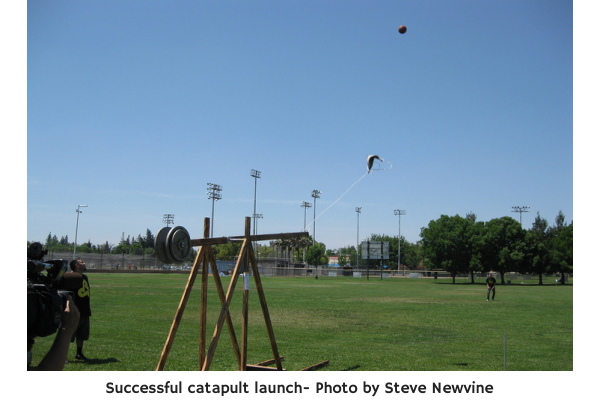 In a tradition that started fifteen years ago, students brought their full-scale trebuchets, a type of catapult, and launched basketballs across the field. The devices need to move the ball at least fifteen meters in order for the student teams to get a high grade. But from the looks of things on that sunny spring day near the end of the semester, no one was going to miss that minimum. The trebuchet uses the energy of a raised counterweight to throw a projectile, in this case a basketball. Powered only by gravity, the counterweight provides the force necessary to fling the throwing arm. A sling at the end of that arm holds the projectile. When the weight is transferred through the throwing arm, the ball goes flying through the air. It takes a good deal of teamwork to be successful in the competition. Each person has to be focused on how their catapult works and what it can do. Each has to coordinate with one another in order to have a winning effort. They have to trust not only the others on the team, but themselves as well. 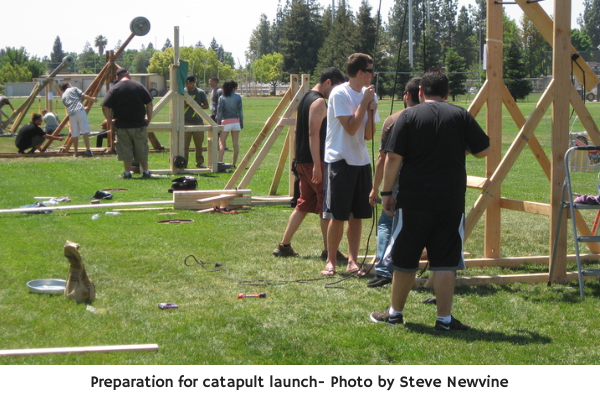 The students must design, construct, and launch the trebuchets. There are no springs to create momentum. Weights are added to the catapult structure to provide the force. Ropes link the wood base to the carrier sleeve holding the ball. There are about thirty students involved in the competition. Each one that I spoke to has plans to transfer to a four-year college or university after they leave Merced College. 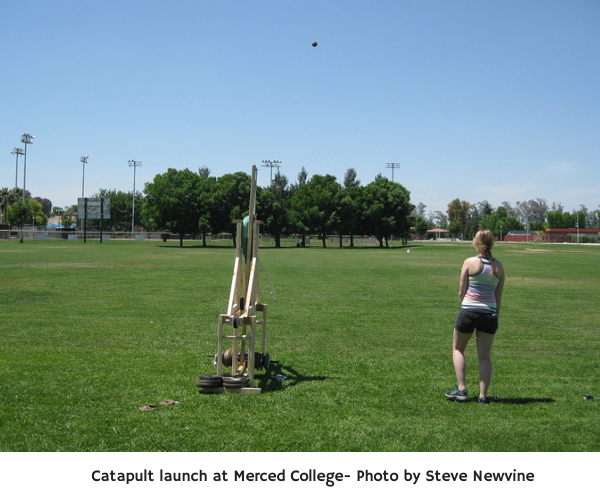 While the majority of students in this program are men, I spoke to two women who were readying their so-called floating arm trebuchet for the competition. The women told me both are entering the Bio Engineering program at UC Merced this fall. “It’s interesting when we can take the science out of the classroom,” one of them said. Among the careers this group of students are pursing include: computer science, electrical engineering, math education, and medicine. They come to Merced College from communities throughout Merced County including Planada, LeGrand, Gustine, Atwater, and Dos Palos. One of the students is from San Diego. They are in the class because they have a passion for physics. The Siege Weapon Competition, coming just before final exams, is a way to apply what they’ve learned throughout the semester. It is a ritual these students endure gladly as they wrap up another schedule of classes. They are on their way to a college diploma and a future that is filled with opportunity. For these students, the event was a way to celebrate the rewards that come from teamwork and friendship among classmates. And it was a great way to end the semester for these future teachers, doctors, engineers, and scientists.